Did you know the U.S. government has rolled out a big new federal program to revive the U.S. manufacturing sector? The proposed budget for this new effort now surpasses $2.4 billion, and, surprisingly, it has received a level of bipartisan support that hasn't been seen for years, if not decades, for manufacturing. This new program has a big mouthful of a name -- the National Network for Manufacturing Innovation or NNMI -- and it's targeted at correcting one of the most fundamental weaknesses in America's manufacturing infrastructure: our waning competitiveness in manufacturing technologies. I call this project "top secret" because very few people know about it or understand it. What are manufacturing technologies? Quite simply, they are the high-tech machines, tools, equipment and software that actually help make things in factories. Things like metalcutting machines, lasers, robots and, increasingly, 3D printers. When the U.S. manufacturing sector began its long slide a few decades ago, which culminated in the loss of 6 million jobs between 2000 and 2011, a lot of blame was given to low wages in foreign countries and free trade deals. By and large, the conventional wisdom has been that profit-driven companies simply outsourced our jobs. There was nary a mention of how the U.S. was losing its competitiveness in manufacturing technologies. As it turns out, this weakness has played a significant role in the deterioration of the U.S. manufacturing sector. And it's one that has grown ever more concerning to the federal government, especially the Department of Defense, whose job it is to protect us. It might even be fair to say there's been a certain level of alarm in some circles about how much technical capability we've lost and what this might mean in the future if we don't fix it. Which helps to explain the urgency felt by Republicans and Democrats who supported the Revitalize American Manufacturing and Innovation Act, which created the NNMI, in late 2014. Advanced manufacturing technologies are growing more important every day as they substantially change the way things are made now and in the future. Today, these technologies aren't just replacing labor, but they are also making it far more productive. But because America has fallen so far behind in this area, we import most of these technologies -- from Germany, Japan, China, South Korea, Italy, Switzerland and other countries. The trade deficit on machine tools was $3.9 billion last year, according the to the U.S. Bureau of Economic Analysis, and that's just one area of manufacturing technology. My staff and I at Advanced Manufacturing Media spend an awful lot of our time on airplanes, traveling overseas to learn about these technologies. The investments being made around the world in this area are impressive, if not terrifying. The U.S. would have to spend $6 billion a year, for example, to match what Germany spends in this area. To catch China, the U.S. would have to spend a daunting $222 billion annually, according to a research report from the North American Manufacturing Research Institution of SME. On one hand, we should all be grateful for the fruits of these foreign investments because they are enabling the US, and our highly productive workforce, to reshore an increasing amount of manufacturing work. On the other hand, we should be ashamed about what's happened to this foundational part of our economy. More than that, we need to understand what it means if we don't fix it. Take robots. The first industrial robot, the Unimate, was invented in the United States in the 1950s, and General Motors used it in its factories. But today, the U.S. provides very few of the industrial robots used around the world. That's because there simply aren't many industrial robot companies left in the United States. This situation represents a colossal fail, and it's one that's costing the United States a lot of jobs and money that could have been ours had we invested more wisely. Last year was a record year of robots sales in North America, because robots are playing a bigger role in manufacturing all the time. But almost every time we put a robot to work in the US, we send our money overseas to get the robot. Or take 3D printing, one of the most promising new technologies to hit manufacturing in decades, maybe even in centuries. The concept of printing an object, layer by layer, from a digital design file originated in the 1980s, and Colorado native Chuck Hull is widely regarded as the inventor. Today, a heated global race is on to achieve leadership in 3D printing, which is referred to as "additive manufacturing" in the industry. But despite being invented here, it is seriously debatable whether the U.S. or Europe is now regarded as the current leader in this area, and China is investing aggressively. If we lose this race in 3D printing, our nation will have lost an enormous opportunity. The economic consequences of America's long slide in manufacturing technologies are profound, and it will likely take a strategic and sustained effort over several decades to get us out of this mess. The good news is that manufacturing technologies are constantly changing in order to bring new products to market in a more efficient, high quality manner. So we can catch up and dominate again if we put our minds to it. And this is precisely what the National Network for Manufacturing Innovation is all about. 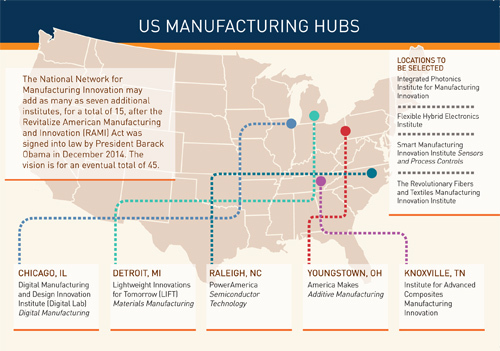 The vision is to have 45 manufacturing hubs across the country that invest in developing strategically selected manufacturing technologies in partnership with private companies, academic institutions and different parts of the U.S. government. The first hub is called America Makes, and it's based in Youngstown, OH, and is focused on 3D printing technologies. By the end of the year, America is slated to have nine of these manufacturing hubs up and running. The Department of Defense is supporting 6 of them, while the Department of Energy is supporting three. When it comes to the technology race around the world, the smartest countries know that the real winners aren't necessarily the ones who invent the next iPhone. Rather, they are the countries who develop the manufacturing technologies that will make the next iPhone, drone and car of the future possible. America's leaders have been a bit slow to catch on to this fact, but now that we know about it, let's not be slow to catch up. To read more about the National Network for Manufacturing Innovation, download our exclusive 16-page special report on the new federal program here.